WCPE Episode 249 – Planet Comicon Pre-Flight – WORST. COMIC. PODCAST. EVER! It’s an early episode of the Worst. Comic. Podcast. EVER! With Cullen returning to the land of barbecue, we are putting the show out early this week. That gives everyone a chance to give the show a listen before heading downtown to Planet Comicon. We’re still going to provide you our selections for the Pick 3 for the first Wednesday of April. John and Jerry do our best to guess Cullen’s choice, but he managed to stump us once again! One day, we will figure out what is going on in his head. Now, you should know by now where to find us at Planet Comicon. 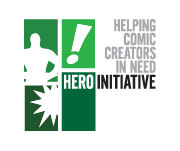 We will be manning the Hero Initiative table at #1030. We will also be hosting out WCPE panel at 10:30 AM on Saturday. If you can remember the numbers 1-0-3-0, you should be able to find us. We take a look at the guest list and make some recommendations of what to bring with you to Planet for autographs. There are so many great guests, you should stay busy meeting so many legendary creators.